“Children’s Day”, as an event, is celebrated on various days in many places around the world, in particular to honor children. It is typically celebrated in the last week of May or first week of June. In Nigeria, it is celebrated on May 28th. Worldwide, it is usually marked with speeches on children’s rights and wellbeing, children TV programs, parties, various actions involving or dedicated to children, families going out, etc Located on over 3000 sq metres of colourful Astroturf grass in Lekki, Fun Factory is the ultimate recreational and entertainment park for kids between the ages of 1 to 10. 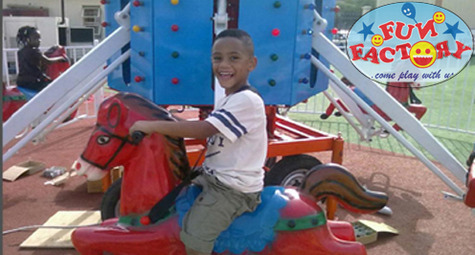 Fun Factory is an interactive entertainment company specializing in fun, creative and exciting games for children including toys, games, bouncy castles, train rides, carousels and swimming pools. Fun Factory is neatly laid out, providing ambience, safety and excitement at the same time. For this deal, DealDey members save a whopping 40% and pay N1,500 for a N2,500 ticket to the Fun Factory Children’s Day Concert. Your mission, should you decide to accept it: Get a one-day pass for 1 Adult & 1 Child to Fun Factory, Lekki and give your youngster the time of their lives on Children’s Day. Priced at N2,500, DealDey members pay only N1,500 for a day’s worth of activities at Fun Factory Children’s Day Concert! Each voucher grants access to One Adult + One Child. Each voucher includes one Cup of Ice Cream & Bag of Popcorn for the Kid.